It's been awhile since I've been to a "San Francisco institution." Recently me and the SO found ourselves down in the Castro neighborhood, a place we don't frequent so much anymore these days. We were standing at the corner of 18th and Castro, staring at the rainbow crosswalk and thinking about getting a lunch bite to eat. I was staring across the street at Harvey's and casually said, "you know, I don't think I've actually eaten there before." The SO was like, "well, if we go, you have to review it." I thought, sure why not. 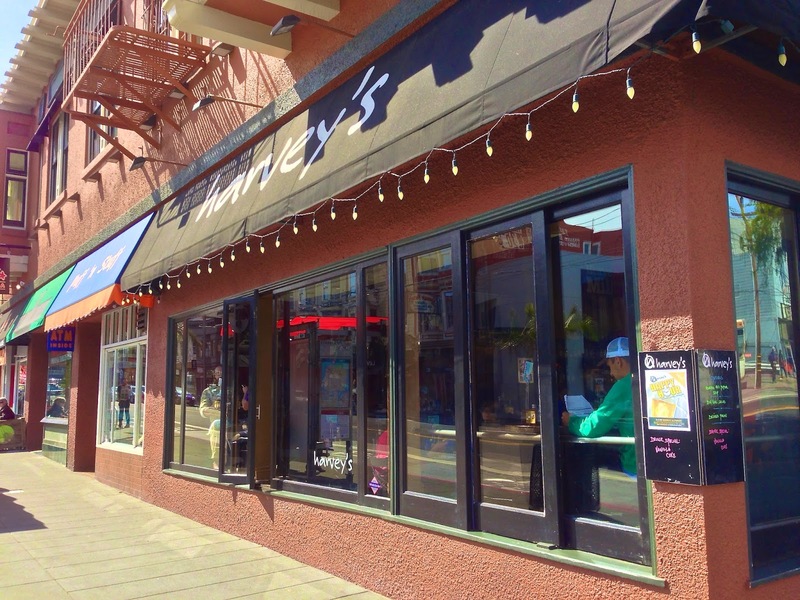 It's the "heart of the Castro," and why not have some old-school fun. Walking in with all it's hi-top brown wood tables, burnt orange coloring and blaring 80's music, it is rather like stepping back in time to what an Applebee's or Bennigans used to be like in the 80's. They even had "Designing Women" playing on the TV screens, though I'll chalk that up to more of a gay thing. We settle into the high chairs that face out to the street. With all the windows and a sparse crowd, it was (and is) a good space to people watch, both inside and outside. We glanced around at the few scattered tables and wondered what brought these folks here at noon on a Monday. There was the single guy filling out loan papers by the window. Two bears laughed jovially while waving down their friend on the sidewalk. Two dudes looked like they rolled out of bed, put on a baseball cap and headed our for brunch after a long night of bartending. Another two younger guys looked like they were having an awkward morning after bite to eat. There was a middle aged guy and girl laughing and drinking way too loudly at the bar. And we couldn't forget the the older gentleman who waltzed in with overstuffed paper bags, looking like a homeless guy and a crazy old man as he sat down, ordered "the largest bloody Mary you have please," and proceeded to continually scratch stuff off a scrap of paper while waiting for his drink. See people watching. But what about the food, I'm sure you're saying. Well, the menu is like a mini book with laminated pages of burgers, salads and other lunch brunch stuff. I figured the easiest thing for me was to build my own burger as it was, which is exactly what I did. I didn't want to be totally weighed down for the day and picked the turkey burger, with sautéed mushrooms, Swiss cheese and bacon on a toasted brioche bun. I also paid the upcharge and subbed in the onion rings, just because. The whole thing will set you back roughly $15. The onion rings are your basic freezer to fryer brand. Not exactly homemade and a little on the greasy side. The bun was nice and toasted, though could have used some butter, you know how I am about that. One thing about turkey burgers, no matter how many toppings and sauces you add, they still come off just a little dry-ish, even if they are cooked as they should be. To counter act this I do ask for lots of mayo, which I did have to ask for twice. In the pantheon of San Francisco burgers, eh, it's fine. Not terrible by any means, but not something I'm gonna say you need to EAT NOW! I feel like maybe with a few tweaks and probably getting sweet potato fries instead would have been a minor upgrade. Otherwise, it is what it is. The SO wanted to be a little more adventurous/healthy and went for the warm spinach salad. I think we both had different ideas of what this would be. I think we were thinking it would be more salad with warm toppings added as opposed to the whole dish being cooked up. It was sautéed spinach, peppers, mushrooms and chunks of bacon with 2 poached eggs and your choice of bread side for $9.95. I will say, it was a decent price for what you get. Though, in terms of flavor it was kind of lacking. Except for the bacon, it's what people tend to think of when they hear the term "healthy eating." Sadly, the sauté was waaayyy too soupy/liquidy. It's like they cooked it all together and transferred it directly from pan to bowl will all the juices. Sadly this just created a soggy mess that lacked seasoning of any kind. It's always sad when the bacon isn't crunchy and here it was all part of the mushy pile. I will say the eggs were nicely paced and had the base been of a different texture then they would have been a great compliment. As is, they just add more squishy sameness. Too bad, the basics are there, I think they just need to be rethought in their preparation. Yes, the food itself is straight out of an 80's bar restaurant too. But let's face it, this place isn't so much about the food as it is about seeing, being seen and drinking. For those things alone I'll give it a thumbs up as it is perfect to people watch on a busy, sunny San Francisco day. As for the food, well, it's there and maybe after a few mimosas or bloody Mary's, taste profile can be improved or at least used to soak up all the alcohol. Either way, I wouldn't expect too much beyond that. If you are hanging out with your friends and some drinks, I don't think it will really matter--you are in the "heart of the Castro" after all.